Peru is a region of major seismic activity, with as many as 200 minor earthquakes occurring on average each year. According to the Country Studies website, there have been more than 70 significant earthquakes in Peru since 1568, or one every six years. The principal factor behind this seismic activity is the interaction of two tectonic plates along the west coast of South America. Here, the dense Nazca Plate, located in the eastern Pacific Ocean, meets the continental South American Plate. The Nazca Plate is subducting beneath the South American Plate, causing an oceanic feature known as the Peru-Chile Trench. This subduction is also responsible for one of western South America’s most defining geographic features: the Andean Range. The Nazca Plate continues to force its way under the continental land mass, while the forces involved in this tectonic interaction lead to a number of natural hazards in Peru. Volcanoes have formed over time, and Peru remains an area of mild volcanic activity. Of more danger to the local population, however, is the threat of earthquakes and related hazards such as landslides, avalanches, and tsunamis. The history of recorded earthquakes in Peru dates back to the mid-1500s. One of the first accounts of a major earthquake dates from 1582, when a quake caused widespread damage to the city of Arequipa, claiming at least 30 lives in the process. 1687 -- An 8.2 magnitude earthquake caused extensive damage to Lima, Callao, and Ica. The resultant tsunami destroyed the port of Pisco. Total fatalities numbered about 5,000. 1746 -- The Lima-Callao earthquake of October 28, 1746, almost leveled Lima, while the subsequent tsunami all but obliterated the port city of Callao. Almost 6,000 casualties were recorded following the earthquake (8.6 to 8.8) and tsunami. An image of Christ, which had previously survived the 1687 quake, also survived the 1746 disaster. This image, known as El Señor de los Milagros (The Lord of Miracles), is the focal point for a major religious procession that takes place in Lima every October. 1868 -- The Arica earthquake of 1868 remains the most powerful quake in the country’s history (Arica was part of Peru at the time, but now belongs to Chile). The quake, which had a magnitude between 8.5 and 9.0, devastated various cities in the south of the country, including Arica, Tacna, and Arequipa, resulting in at least 25,000 casualties. 1928 -- An earthquake caused extensive damage to the city of Chachapoyas in Northern Peru. The event triggered a landslide that killed 25 people. 1946 -- On November 10, a magnitude 7.3 earthquake hit the Ancash region of Peru. The quake triggered landslides that destroyed the town of Quiches and damaged Conchucos and Mayas. The death toll was estimated at between 1,400 and 2,000. 1970 -- The Ancash earthquake of May 31, 1970, remains the worst natural disaster in the history of Peru. The epicenter was located off the coast of Peru; no major tsunamis were recorded. Despite being less powerful than earlier quakes (7.9 to 8.0 on the Richter scale), the earthquake triggered vast landslides to plunge down from the slopes of Mount Huascarán, the highest mountain in Peru. Flows of rock and ice buried the towns of Yungay and Ranrahirca, killing 100,000 people and injuring 200,000 more. 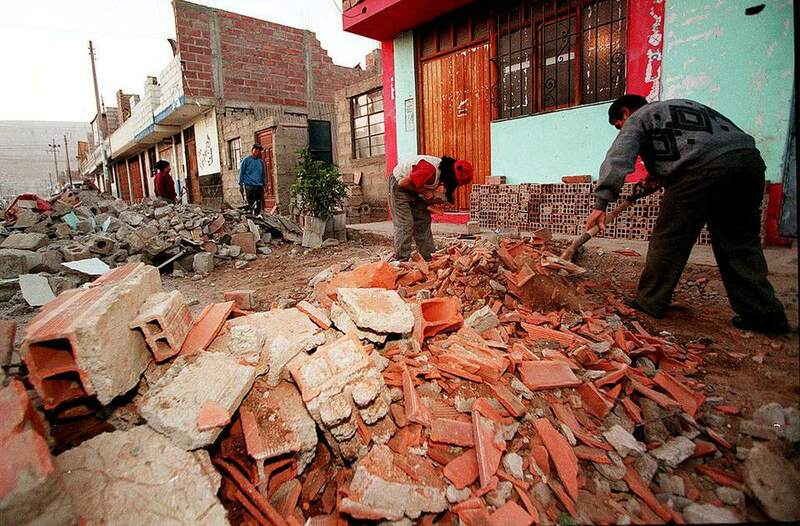 2007 -- On August 15, an 8.0 magnitude earthquake struck the coast of central Peru. The earthquake was felt throughout much of the country, but Pisco, Chincha, and Ica suffered the most extensive damage. In total, the earthquake left 519 people dead and 1,366 wounded, with more than 58,000 homes destroyed. Most of the earthquakes listed above occurred in coastal areas, but all three of Peru’s main geographic regions -- the coast, the highlands, and the jungle -- are subject to seismic activity. The majority of earthquakes (5.5 and above) occur along the subduction zone near the Peru-Chile Trench. The second band of seismic activity occurs along the Andean Range and east into the high jungle (selva alta). The lowland jungles of the Amazon Basin, meanwhile, experience earthquakes deep below the surface, at depths of 300 to 700 km. The Peruvian response to earthquakes continues to improve but has yet to reach levels found in many developed countries. The response to the 2007 earthquake, for example, was heavily criticized despite some positive aspects. The injured were evacuated promptly, there was no spread of disease and the affected population received a decent level of support. However, the initial response suffered from a lack of cohesion. According to Samir Elhawary and Gerardo Castillo in a 2008 study for the Humanitarian Policy Group, “the system at the regional level struggled to cope with the scale of the emergency and the central government, rather than support the regional system, bypassed it by creating a parallel response structure.” This created a level of chaos and inefficiency that held back the overall management of the disaster. In terms of preparedness, the Peruvian Government continues to educate and inform the population about the risks of earthquakes and related hazards. A number of earthquake drills occur each year at a national level, helping to highlight secure zones and exit routes while promoting personal safety procedures. One problem that continues to exist, however, is poor housing construction. Houses with adobe or mud walls are particularly vulnerable to earthquake damage; many such houses exist in Peru, especially in poorer neighborhoods. Most travelers won’t experience anything more than a minor tremor while in Peru, so there’s no need to worry about earthquakes before or during your trip. If you do feel a tremor, look for an earthquake safe zone in your immediate vicinity (if you cannot see a safe zone, follow the tips below). Safe zones are highlighted by green and white signs saying “Zona Segura en Casos de Sismos" (“earthquake” in Spanish is sismo or terremoto). For more tips about earthquake safety while traveling, make sure to read enough information on the subject. It’s also a good idea to register your trip with your embassy before going to Peru.